Meet the astonishing Cradle of Egypt – a gorgeous mash-up of fulfilling match-3 pleasure and splendid city-builder game. If you like this free game, try Cradle of Rome 2. Cradle of Egypt is a rightful successor to the celebrity Cradle of… series of puzzle games. Take a step back in time to an era before the great Pharaohs and magnificent monuments of Egypt existed. There, you are the one with the foresight to bring all of the tribes together and start building what will become one of the greatest civilizations that humans have ever known. Take the journey and travel through five ancient epochs to build your own Egypt. Start from a small village and develop your settlement into a most powerful nation through 100 fantastic Match 3 levels. Collect resources then construct amazing structures including the gorgeous Pyramids of Giza, the Sphinx, and more. Enjoy three modes of play, beautiful hand-drawn graphics, great bonuses, challenging mini-games, and over 25 trophies. 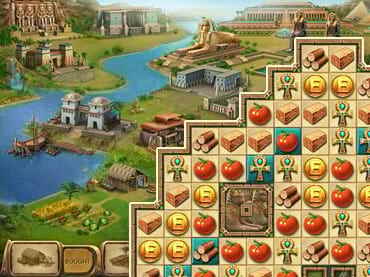 Download free full version game and raise one of the greatest civilizations ever known in Cradle of Egypt! - Journey to the cradle of Egypt. If you have questions about Cradle of Egypt game, please contact us using this form.